Woolly World in Super Smash Bros. for Wii U.
Woolly World (ヨッシー ウールワールド, Yoshi Wool World) is a stage based on Yoshi's Woolly World that appears in Super Smash Bros. for Wii U. The level follows the fabric-like aesthetic of the game it is themed from. It was first spotted in the October 2014 50-Fact Extravaganza, and then officially unveiled in the Director's Room on November 6. On the Miiverse post revealing the stage, director Masahiro Sakurai noted that the stage was added to the game late in development. The stage starts in a felt hill area, with a windmill and trees in the background. Clouds and a rocket make up the platforms, and they teeter depending on the weights of the fighters on them. After some time, the stage warns the players that the stage will transition, and the level moves into the sky. The ground disappears, and the only ground the fighters can stand on are the clouds and rocket. The stage transitions into a third area, coming back down to the ground. The area is different, consisting of toy blocks. After this, the ground disappears as the stage takes to the sky; here, the background changes to show various blocks and clouds and even a rainbow wheel. Like in the second phase, the clouds and rocket, plus the scale that balances them are the only platforms the stage has. After this, the stage transitions back to the beginning felt hill area. The Ω form is set in the "Knitty Knotty Windmill Hill" section of the stage; it will not change into any other form. Smaller platforms and walk-off areas are removed. The windmills in Yoshi's Woolly World. The areas of this stage are combined from multiple levels in Yoshi's Woolly World. The background of the initial area is based on World 1-5, Knitty-Knotty Windmill Hill. The mobile-like platforms above the ground which persist into the sky section of the stage are based on World 3-2, Wobble Mobile Jaunt; the second landing area also resembles that stage. Yoshi's Woolly World was released several months after the release of SSB4, making this stage being the only instance in the Smash series of a stage based on a then-unreleased title. This stage is banned from tournaments due to it containing walk-off blast lines, which encourage camping and allow for early KOs. 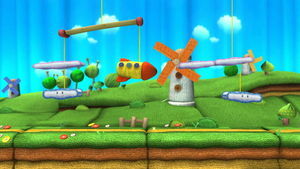 The stage also forces players to fight on the platforms created by the clouds and rocket, which makes gameplay very difficult. The beginning area of the stage. The sky part of the stage. The third area of the stage. Prior to renaming Yoshi's Island (SSB) to Super Happy Tree in Ultimate, this was the only stage from the Yoshi universe to not contain "Yoshi" in its name. Additionally, it is the only one that does not appear in Ultimate. When setting a Pitfall in place on this stage, it can be seen that the ground where it is set makes it somewhat visible due to the ground being "pressed on" when someone or something is on it. This is the only non-DLC stage to be based on a game released after Super Smash Bros. for Wii U. When an extreme amount of weight is pressed on the platforms, the platforms may occasionally "snap", the top platform will be tilted so low that the rocket and cloud will go through it. Woolly World is one of five stages from Super Smash Bros for Wii U not to return in Ultimate, the others being Orbital Gate Assault, Pyrosphere, Jungle Hijinxs and Miiverse. This is also the only Yoshi stage that is not in Ultimate.